Risotto had (has still?) a reputation of being difficult. You do have to attend to it, but otherwise it is quite easy. If anything, I find tending to a risotto relaxing, slowly adding to it, stirring it, tasting it. I highly recommend it. If you haven’t made it, or you want some new ideas, here some recipes to get started. 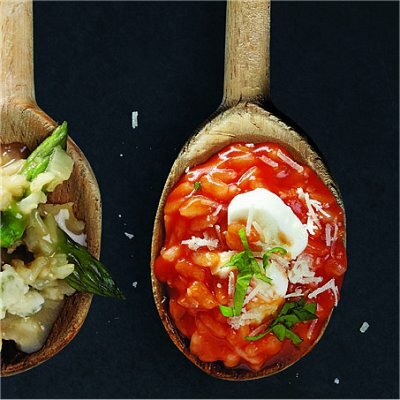 I really liked this Caprese risotto recipe. A small tip: when adding the garlic, I also added some diced red onion and sliced cooked sausage. I also used spicy vegetable sauce instead of tomato juice, and around 1 tbsp of dried basil as I was adding the liquid. This entry was posted in food and tagged food, italian, italianfood, Italy, rice, risotto. Bookmark the permalink.